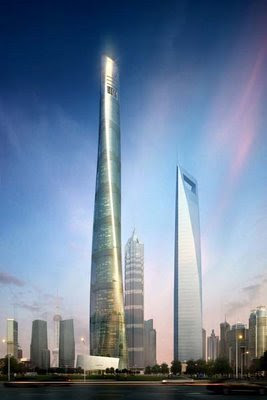 Shanghai Unveils their Latest Tallest Tower. Construction projects are grinding to a halt as financing runs dry elsewhere in the world, but in China's biggest city, they're still going strong. Whilst the world economies brace themselves for a downturn in the coming months, economic powerhouse China unveils their latest addition to the Shanghai skyline. 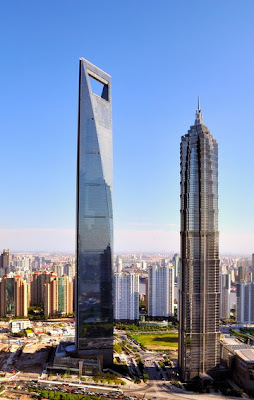 Currently, the tallest tower in the city and 3rd in the world after the Burj Dubai and Taipei 101 is the 1,614-foot tall Shanghai World Financial Center, located in Lujiazui region. Completed in August this year, the Tower had been named as the best skyscraper built this year. Today, the city officially begins work on what will become its tallest skyscraper when completed - a 632-meter (2,073-foot) tower. While China's economy is slowing and exporters are feeling the pinch, the sinuous glass building -- to be called the Shanghai Tower -- is one of a slew of government-funded construction projects that authorities are using to stimulate growth and create jobs. With a gloomy economy hovering around us, its a positive sign to see economic powerhouses still pumping more money and expenditure into the system to support and boost the economy.